There are many secrets to discover throughout the Walt Disney World Resort. The talented Disney Imagineers have created many of these secrets "hidden" in plain sight, waiting for the curious guest to discover them. Today Only WDWorld takes you to Epcot Germany to find out the Secret of the "Missing Hapsburg Emperor." 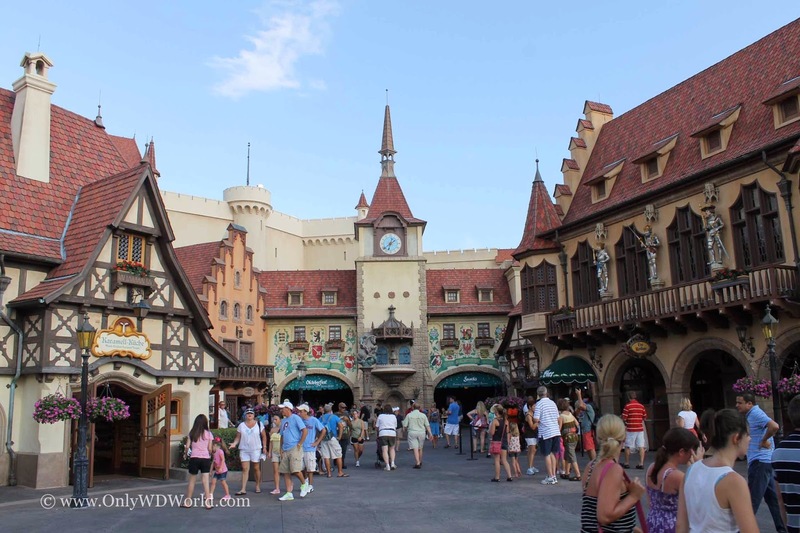 When you visit the Epcot Germany Pavilion in Epcot's World Showcase you see a recreation of a Bavarian village platz (plaza.) Here you will see a mixture of architectural styles in the various buildings that range from those you would see in the 13th century to the 17th centuries. The Disney Imagineers looked to create a classic image of Germany that combines pieces and aspects of many real buildings and structures from across the country. By combining certain features of many different cities and buildings they successfully create a perfect storybook image of Germany as you may imagine in the fairy tales. 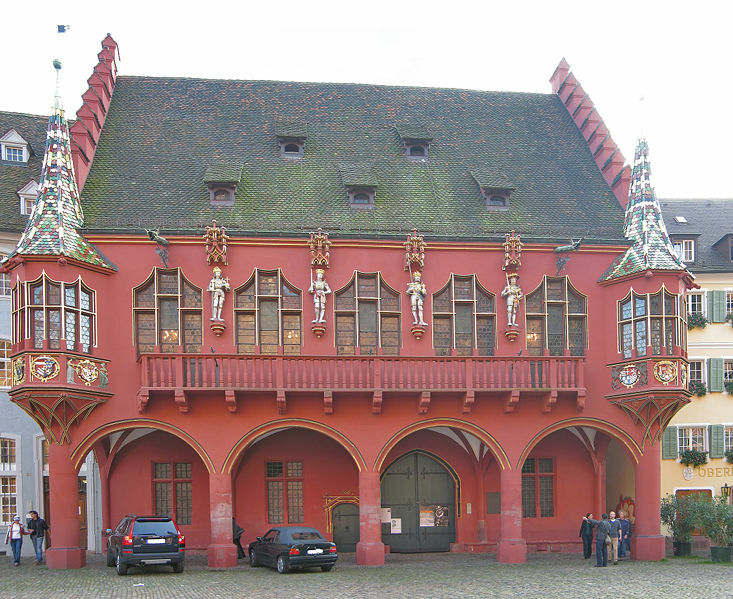 One interesting building is the Gild Hall which is a close facsimile of the Kaufhaus found in Freiburg, Germany (pictured below.) The Historic Merchants Hall was built in 1520 - 1521. The statues on the front of the building represent 4 of the Hapsburg Emperors and were sculpted between 1520 and 1531 by Sixt von Staufen. The Epcot version of the building is pictured at the beginning of this article and again below . 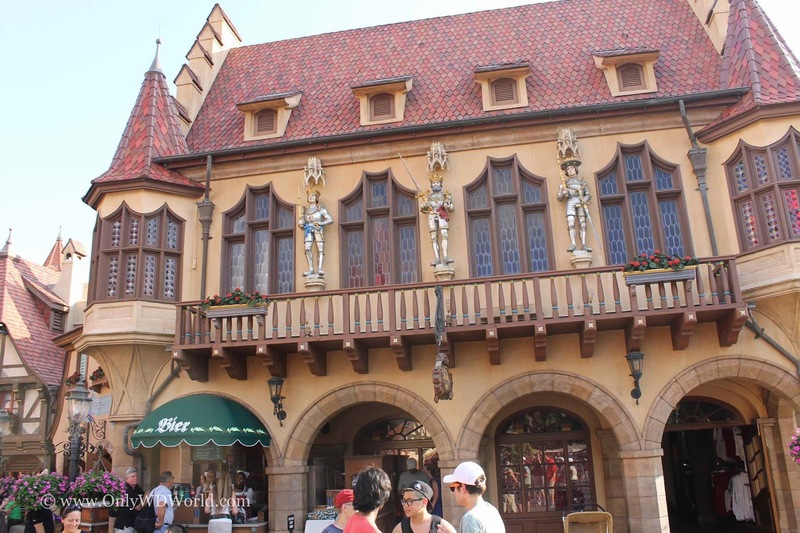 Although the color of the building has been altered to fit in with the other buildings in Epcot's German Village, the architecture is remarkably similar. Take some time comparing the pictures and you will see the lengths that the Disney Imagineers went to reproduce the original Kaufhaus. 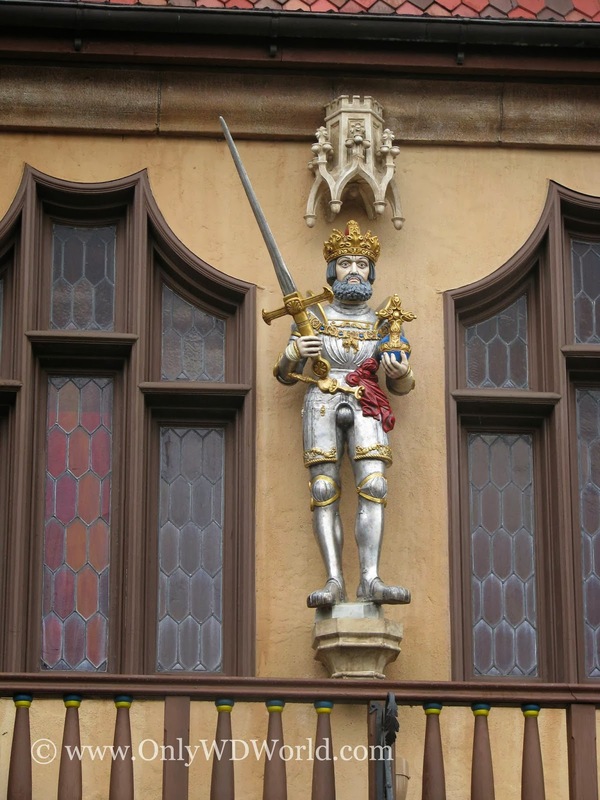 One notable different is that the original Kaufhaus has 4 statues of Hapsburg Emperors, while the Epcot version only has 3. 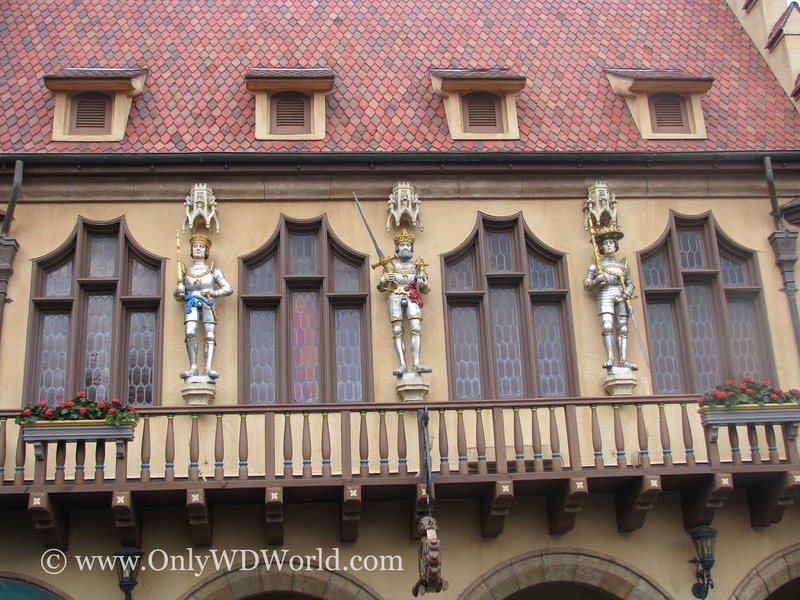 This is due to the fact that in order to keep this building at the reduced scale that is consistent with the rest of the Germany Pavilion in Epcot, it was necessary to only have 4 windows and 3 statues. 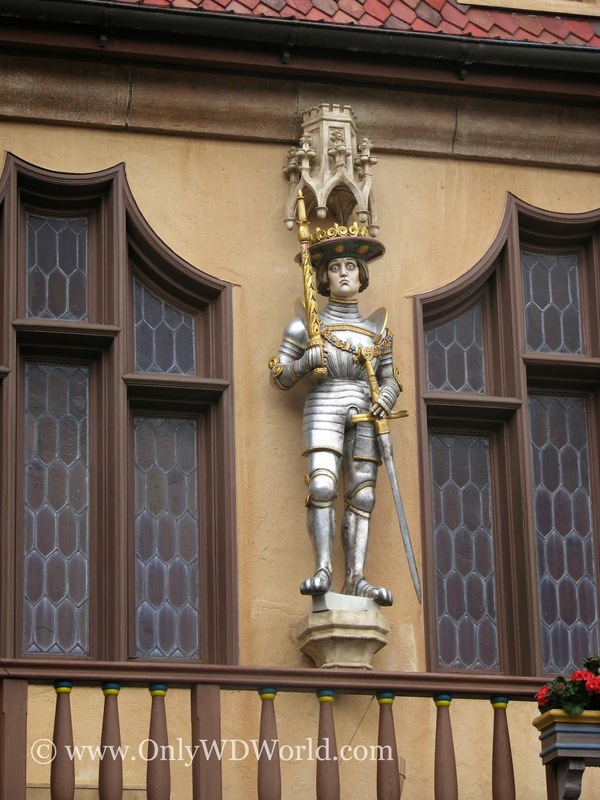 This led to the statue of Hapsburg Emperor Maximilian I being left out of the Disney World structure. The Hapsburg Royal Family ruled Austria-Hungary from 1273 - 1918 and also led over Germany for much of this time. You must also realize that the Hapsburg family was in power at the time the original Kaufhaus was built. The 4 Hapsburgs that were chosen were the 4 most noteworthy and powerful in recent times when the statues were created in 1520 - 1531. The four Hapsburg emperors represented on the original Kaufhaus are: Maximilian I, Philip I, Charles V, & Ferdinand I. King Philip I, also known as, King Phillip The Beautiful of Castile, lived from 1478 - 1506. Philip was the first Hapsburg King of Castile. He also inherited the greater part of Burgundy and the Netherlands, and also became the first Habsburg Monarch in Spain. Philip's father was Maximilian I, Holy Roman Emperor. Emperor Charles V lived from 1500 - 1558. The was the son of Philip I and as such inherited his monarchy of Castile and Burgundy. When his paternal grandfather, Maximilian I, passed away he assumed his title as Holy Roman Emperor. He also inherited Aragon from his maternal grandfather Ferdinand II. Charles' realm was described as "the empire on which the sun never sets." spanning nearly 4 million sq kilometers across Europe, the Far East, and the Americas. Emperor Ferdinand I was the younger brother of Charles V and lived from 1503 - 1564. Ferdinand I was a Central European Monarch from the House of Hapsburg. He also ruled much of Austria during the majority of his public life. Ferdinand I assumed the title of Holy Roman Emperor in 1558 from the passing of his brother Charles, although most of Charles' other titles were passed to his son, Philip. Disney World Hidden Secret Revealed! When people visit Epcot's World Showcase they automatically think of all of the great food (and they should! ), but there is so much more to see and enjoy. Each pavilion in the World Showcase is filled with parts of that country's history that is waiting to be discovered. Much of the detail is very subtle with little attention drawn to it. Such is the case of the replica of the Kaufhaus in the Germany Pavilion and the statues of the Hapsburg Emperors. 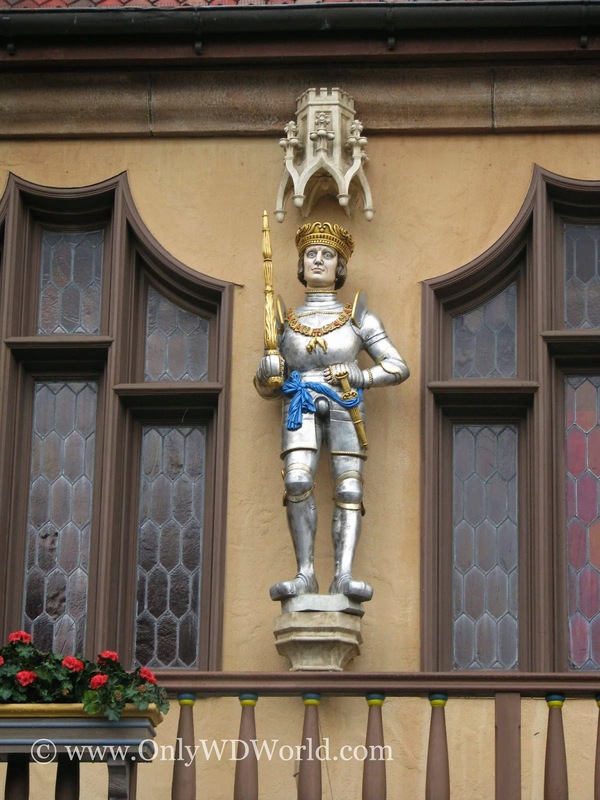 The next time you are in Epcot, point out the statues of the Emperors to your family and earn bonus points by telling them that the "real" building in Germany actually has 4! 0 comments to "Disney World Hidden Secret: Epcot Germany Missing Emperor"